Callebaut dark Belgian chocolate, Valrhona French chocolate, Michigan-grown dried cherries, Scharffen Berger cocoa powder, toasted walnuts, sweet butter from grass fed cows, pure vanilla, and unbleached and unbromated flour. It’s Summertime and Chocolate Makes for Easy Living! It’s summer and as Porgy & Bess sing, “the living is easy,” but summer can be a rough season for all varieties of chocolate products. 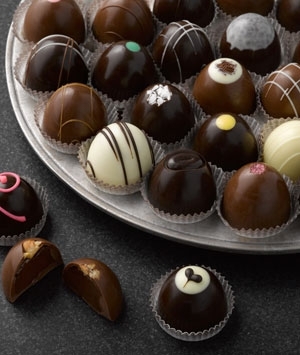 High temperatures and longer days can strike a fatal blow to your favorite chocolate treats. Despite the heat, there's no reason not to enjoy one of life's great pleasures. So it takes a little extra thought to create a refreshing, chocolate smorgasbord guaranteed to satisfy club members’ cravings and that arrive unaffected by heat. So this month we sample unique and delicious chocolate wares from Zingerman’s Bakehouse—chocolate sensations chosen because they both comfort well and travel well. Our chocolate gourmands at Zingerman's food emporium in Ann Arbor, Michigan make some of the world's most delicious delicacies using only the finest natural ingredients. This month’s unique assortment from Zingerman’s should please the most discriminating palates. In March of 1982, Paul Saginaw and Ari Weinzweig opened Zingerman’s Delicatessen in an historic building in the thriving college town of Ann Arbor, Michigan. The Deli got its start with a small selection of great-tasting specialty foods, as host of traditional Jewish dishes and a relatively short sandwich menu. They now serve up thousands of made-to-order sandwiches with ingredients like Zingerman's corned beef and pastrami, free range chicken and turkey, and homemade chopped liver and chicken salad. They also stock an exceptional array of farmhouse cheeses, estate-bottled olive oils, varietal vinegars, smoked fish, salami, coffee, tea, and much, much more. In addition to a Zagat rating, Zingerman’s has won all kinds of awards and accolades over the decades. In 1992, they opened Zingerman’s Bakehouse—with an on-site bakery—to provide traditionally-baked breads and pastries that met the high standards of Zingerman’s customers across the nation. Today, Zingerman’s ships its products around the world. From its inception, they have been committed to delivering the most flavorful, traditionally-made foods and baked goods to customers. They consistently work to find more authentic ingredients and improved techniques to provide even more flavorful baked goods. From the get-go, Zingerman’s belief was that customers can tell the difference between mediocre and marvelous and that they deserve, and will pay for, marvelous! Chocolate Cherry Bread—Bread or Dessert? Your Call! The inspiration for Zingerman's Chocolate Cherry Bread comes from "Black Forest Gateaux", which is a chocolate-cake made with cherries and cream. Is it really bread? You bet it is! But it's not like any bread you've ever tasted! It's more like a mound of HUGE dark Belgian chocolate chunks and flavor-packed Michigan-grown dried cherries surrounded by full flavored dark round bread. It should come as no surprise that this wild and crazy bread has fans worldwide. In keeping with their impeccable standards, this unique treat is made from the best Belgian and French chocolates (Callebaut chocolate from Belgium and Valrhona chocolate from France) and dozens of dried cherries from Michigan. You see, anything is possible when a chocolate lover lets the imagination run wild! There is a debate over whether it's the chocolate or the cherries that make this bread so impressive. Mo Frechette, a Zingerman's executive, says this bread wouldn't be worthy of its remarkable acclaim without both the two renowned chocolate ingredients and the incomparable Michigan cherries. Not only is this Chocolate Cherry Bread delicious, it could be downright addicting. A few minutes in the oven and the chocolate chunks begin melting, the aroma of cocoa fills the air and those within whiffing distance will find themselves powerless to stop salivating. Spread it with just a hint of sweet butter or warm it and top it with a scoop of vanilla ice cream. Absolutely delicious! Of course, this bread is great on its own as well. You can enjoy this gustatory treat with or without butter, with ice cream, or as chocolate fondue. A Short History of Cherries In the U.S.
Cherries have pleased the palates of food lovers for centuries. Their ruby-red color and tangy taste won cherries a prominent place on the tables of Roman conquerors, Greek citizens, and Chinese noblemen. Later, French colonists from Normandy brought pits and planted them along the Saint Lawrence River and into the Great Lakes area. Cherry trees were part of the gardens of French settlers who established Detroit, Vincennes, and other Midwestern cities. Modern day cherry production began in the mid 1800s. Peter Dougherty, a Presbyterian missionary living in northern Michigan, planted cherry trees in 1852 near Traverse City, Michigan. Much to the surprise of the other farmers and Indians who lived in the area, Dougherty's cherry trees flourished. Soon other residents of the area planted trees. The area proved to be ideal for growing cherries because Lake Michigan tempers Arctic winds in winter and cools the orchards in summer. Today, the U.S. cherry industry produces more than 650 million pounds of tart and sweet cherries each year. Michigan grows about 75 percent of the tart cherry crop. Oregon and Washington harvest about 60 percent of the sweet cherry crop. Other states that grow cherries commercially include Utah, Wisconsin, New York, Pennsylvania, and California. Several years ago, Zingerman's issued a challenge to their bakers: come up with a cake that captures all the soft, subtle goodness of a cup of hot cocoa. 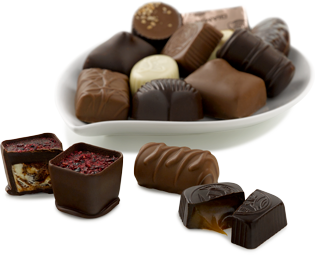 They tasted their way through a dozen different trials and the winning result is one of your Gourmet Chocolate of the Month Club selections. The key ingredient is a very special cocoa, made for Zingerman's by Scharffen Berger, one of the leaders in America's pursuit of fine chocolate. They make a natural (meaning not alkalized like most) cocoa powder that is more complex and truly elegant than any we've ever tried. Like a cup of well-made cocoa, this is a cake you can adore at anytime—with morning coffee, for a subtle sweet snack, or to cap off a long day before you head off to bed. Loyal Zingerman’s Bakehouse patrons have been lusting after these treats for almost two decades. Soft, chewy, and made with pure Belgian chocolate, these two brownies (one each of Zingerman’s original and famous Magic & Black Magic Brownies) are some of the best-tasting baked treats we’ve ever encountered. Your Magic Brownie is characterized by soft, Belgian chocolate, a chewy interior, and a thin chocolate crust dotted with toasted walnuts. Your Black Magic Brownie has the same intense, chewy chocolate base, but baked without the walnuts. USA Today raved about them and described them as "brownies the size of a wallet." No wonder they fly out of the store at the rate of over a thousand a week, recession or no recession. What are the secrets of their bakers’ success? You can't tell just from looking at a brownie or cookie whether it's been baked with butter or shortening. The bottom line on baked goods' flavor is that butter tastes better. It's also much more expensive, so more and more commercial bakeries are shifting towards less expensive shortenings or margarine. You can taste and smell the difference at Zingerman's Bakehouse. The sweet, rich scent of butter is right up front. Shortening, on the other hand, has no aroma to speak of. Superb baked goods should smell superb. The Bakehouse doesn't just use any butter. Most of their baked goods start with sweet butter from grass fed cows. It tastes better, has less water, and more flavor. Bottom line – the better the butter the better the baked goods. Zingerman’s uses only all-natural ingredients: no preservatives, no gums, no sugar, and no fillers. The result is lots of wonderful flavor and exceptionally good brownies. Real vanilla is the first thing that many bakeries eliminate to cut costs and increase profits. You can use industrial, imitation vanilla for about one-twentieth of the cost of the real thing. And, in proportion to other ingredients, you use so little vanilla in a batch of baked goods it's easy to delude yourself into thinking that no one will notice. But you can clearly taste the difference. Real vanilla is literally almost 150 times as complex in flavor as artificial vanilla. Zingerman’s doesn’t ever use anything but real vanilla because it adds incredible aroma and flavor to their brownies and other baked goods. The bleaching process used to be done naturally; as the flour oxidized it was bleached out. This was how milling companies used to make bleached flour. That method has gone by the wayside as it is too time consuming. Now chemical bleaching agents are added to the flour. Unbromated flour is higher in protein and doesn’t contain potassium bromate which is considered unhealthy by some and not allowed in Europe for instance. The better the flour, the better the baked goods – which is why Zingerman’s Bakehouse doesn’t use bleached or bromated flour. They work with stone-ground flour from local millers like the Daily Grind in Ann Arbor, as well as from the highly respected King Arthur mills in upstate New York. Fresh Eggs The norm nowadays for commercial bakeries is to use frozen eggs that come in white plastic buckets. The Bakehouse stubbornly sticks to old-fashioned eggs in the traditional oval-shaped white shell - the way they made 'em "back in the good old days." They’re delivered fresh daily from Jim Bilbie's Egg Farm just outside Ann Arbor. Toasted Pecans, Almonds, and Walnuts Toasting takes time and time is money. But it also adds a lot of flavor to nuts. Zingerman’s votes for flavor every time. Toasting brings depth to their brownies and everything else they make with nuts in it. Love The crew at the Bakehouse is adamant that everything that comes from their ovens receives a special seal of approval - the kind you'd get if you were to go over to your grandmother's for a cold glass of milk and a she gave you a brownie right out of the oven. Enjoy!